The weekend is drawing closer and you're running out of budget-friendly ways to entertain your kids. Cinema outings, water parks and amusement parks - all cost money. And for parents walking the financial tightrope, even a few hundred dirhams saved can make a huge difference. You may be on a strict budget, but that doesn't mean you have to sacrifice having fun with your children. There are plenty of ways to keep your kids amused and busy during the weekends and holidays, without spending money. Here are 7 creative ways to help you get started. The good old beach is a great spot to relax and unwind with the kids in tow. 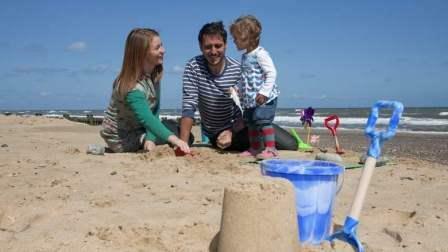 All you need is a picnic basket and some sand castle equipment to make it a fun and memorable outing for your children. How about flying kites at the beach with your kids? You can even get a bit more creative and make kites at home and get your kids involved in the craft. If you're an 80s or 90s kid, you know how much fun it was to sit down with your family and friends to play some board games. Why not introduce your kids to a fun board game? You can make a great family day out of this, and in the bargain, improve your kids' creative thinking skills, vocabulary and so much more. You don't have to go too far away from home for it to qualify as a day out with the kids. Just pick the closest public park or even the park inside your community and plan a picnic there. You can get the kids to help you assemble a picnic lunch, prepare sandwiches and pack the toys they'd like to play with. Take a football along. What's better? You can even come up with ideas that will help you make something useful out of waste. For example, you could decorate old paper bags with paint, old cupcake liners and pencil shavings to make cute gift bags. Whether it is baking a batch of brownies or making pizza from scratch, get your kids involved in the cooking process. This can keep them busy on a lazy Friday afternoon and give you one or two extra pair of hands to help with the food prep. Just remember to not have a panic attack if something spills! How about turning this into a competition? Have a mom's team vs. dad's team pancake cook-off or a who-can-do-it-fastest pizza assembly contest. There are so many ways to turn your humble kitchen into a super-fun activity zone for the whole family. And the best part, the kids can help you clean up afterwards. You can download a family-friendly movie or watch one online with your kids over the weekend. Make the movie-watching experience extra fun by going the extra mile. Put one kid in charge of the popcorn, and the other one in charge of making the couch as comfy as possible. Bring in all the extra pillows and blankets, and turn off the lights before you sit down to enjoy the movie. There are quite a few animal shelters and animal rescue organisations in the UAE - K9 Friends, the Sharjah Cat and Dog Shelter, Stray Dogs Centre UAQ, among others. You can take your kids to spend a day with the furry friends or even volunteer to help these organisations over the weekend. Don't have an animal shelter close by, how about taking your kids to visit the local pet store? They can pet the cute and fuzzy puppies and kittens and marvel at the colourful fish in the aquariums, and basically just have an all around great time.